Monitor reports one dead in first regime or Russian airstrike on Eastern Ghouta since ceasefire took effect last weekend. Warplanes struck a key rebel bastion east of the Syrian capital on Friday for the first time since a fragile truce began over the weekend, a monitor said. 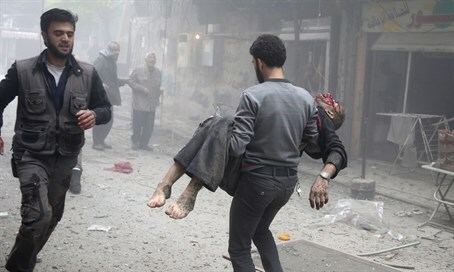 "Two air strikes hit the edge of the town of Douma in Eastern Ghouta and one person was killed," said Rami Abdel Rahman, head of the Britain-based Syrian Observatory for Human Rights. He said the strikes were conducted by either Syrian or Russian planes. It was unclear whether the individual killed was a civilian or a fighter. Friday marked the seventh day of the truce brokered by the United States and Russia. Eastern Ghouta, the largest rebel bastion east of Damascus, was regularly and fiercely bombarded by government forces in the lead-up to the ceasefire. On the day before the truce came into effect, 25 air raids targeted the opposition stronghold, 10 of which struck Douma. But the suburb had seen relative calm since the ceasefire began. The most powerful rebel group in Eastern Ghouta is Jaish al-Islam (Army of Islam) which is part of the High Negotiations Committee opposition grouping that agreed to the ceasefire. The Observatory, which relies on a network of sources on the ground, says it determines whether strikes were carried out by Syrian, Russian or US-led coalition aircraft based on the location of the raids, flight patterns and the types of planes involved. A local committee of activists wrote on Facebook that three raids, believed to be Russian, targeted the edges of Douma on Friday. "There is also heavy artillery targeting the town," the Douma Coordination Committee wrote. More than 270,000 people have been killed and millions displaced by the five-year war.